Observe a kids gymnastics or dance class, and you will find that even among 6 year old girls (arguably the most flexible demographic) you will find significant differences in flexibility. Some yawn as they pancaking flat into pike straddle over splits and others grimace while straining in their pike straddle, the vast distance between their chest and the floor held by an invisible force field of inflexible genes. The controversial early age high intensity training of Chinese gymnastics. The inflexible kids tend to give up on activities such as gymnastics and dance that require above average mobility and move on to sports that don’t require much mobility like soccer and running. It is possible that gymnastics and dance make a child flexible and soccer and running make them inflexible but given this self selection bias, you can’t really be sure. Vivek Venkataraman, Thomas Kraft and Nathanial Dominy of Dartmouth recently published a report called Tree Climbing and Human Evolution. They described how honey was and still is a significant source of food in hunter gatherer societies in the Congo, Malaysia and the Philippines. For example: the Mbuti of the central Ituri forest of the Democratic Republic of Congo (DRC) eat 1.826 pounds of honey (3,320 kcal) per day during the 3 month honey season. Efe men in the northern Ituri forest spend 33.8% of their foraging time on honey acquisition and climb trees up to 169 feet tall without safety equipment and accidental falls from trees accounts for 6.6% of all deadt ins the Aka people in the Central African Republic. Most of this honey is found at the top of trees and those humans who are able to safely and efficiently retrieve this jackpot of 3,320kcal a day have a significant survival advantage. Extreme ankle dorsiflexion mobility allows a climber to keep their center of mass closer to the tree and thus save energy and reduce risk of falling while “walking” up thinner vertical trunks. 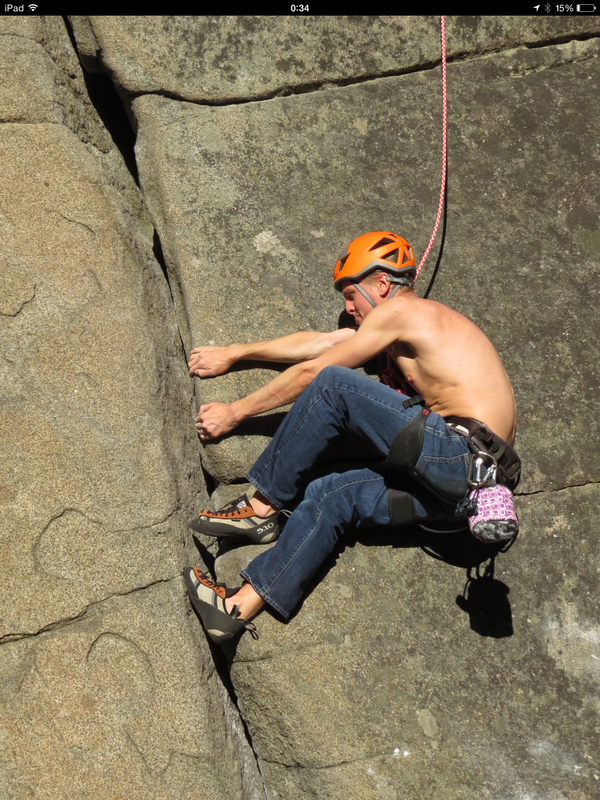 This method of vertical climbing with the sole of the forefoot on the trunk and arms grasping the back of the same trunk is not unlike a a long layback in crack climbing. Mike of his “mike off the map” blog demonstrating the layback in crack climbing. This “layback” style of tree climbing is called changwod in Malaysia and is commonly observed in chimpanzees. Venkataraman measured dorsiflexion in photos of the Batwa of DRC during this style of climbing and found values ranging from 34.4 to 47 degrees: significantly greater than their genetically similar but agriculturally occupied neighbors the Bakiga, and significantly more than Western normative values. Venkataraman et al. measured the fiber length of the Batwa and Bakiga of DRC and the climbing Agta and their non-climbing neighbors the Manobo in the Philippines. 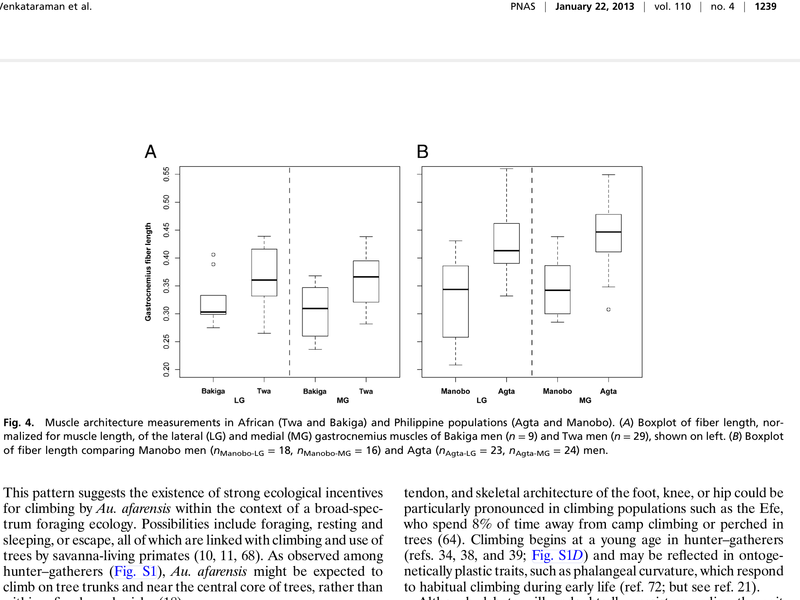 The habitually climbing, non-agricultural groups had longer gastrocnemius length in both the Congo and the Philippines. At the end of the day, these are still just correlations and don’t prove that the climbing created the ankle dorsiflexion and not the other way around. The hunter gatherer groups may have greater ankle range of motion than their agricultural neighbors because of other factors such as currently undetected genetic variations or more time spent squatting. Since Venkataraman et al. 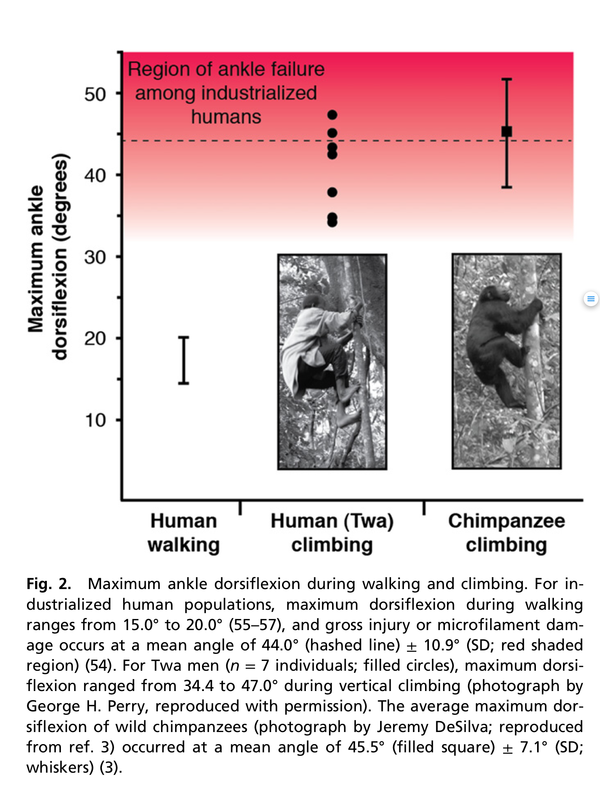 only measured ankle dorsiflexion during climbing of a small portion of the Batwa population, it is not clear whether this extreme dorsiflexion is common among the group or simply that those with the best dorsiflexion became the best climbers and end of making it into the glamorous pages of the Proceedings of the National Academy of Sciences. Follow up research on variation in dorsiflexion from childhood to adulthood according to time spent climbing and squatting would shed further insight on the extent to which the activities of childhood (or adulthood) can drive flexibility. If vertical tree (or pole) climbing proves to be an effective way to gain or maintain ankle dorsiflexion mobility it could be recommended for injury prevention purposes, particularly in children who would likely find the activity more engaging than stretches. For example: a prospective study found that dorsiflexion of less than 35 degrees was associated with higher rates of patellar tendonitis in youth basketball players. Climb the pole at half time anyone? 1. Venkataraman, Vivek V., Thomas S. Kraft, and Nathaniel J. Dominy. 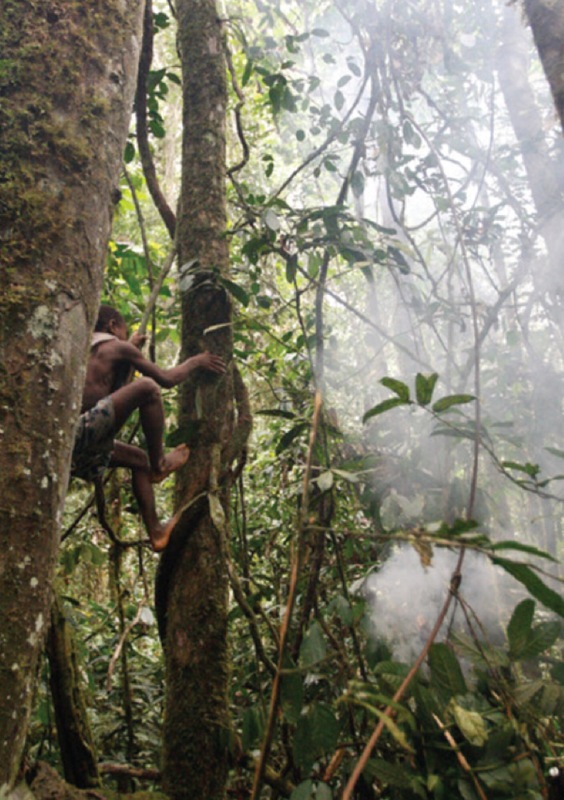 “Tree climbing and human evolution.” Proceedings of the National Academy of Sciences 110.4 (2013): 1237-1242. 2. Moseley, Anne M., Jack Crosbie, and Roger Adams. “Normative data for passive ankle plantarflexion–dorsiflexion flexibility.” Clinical Biomechanics 16.6 (2001): 514-521. 3. Backman, Ludvig J., and Patrik Danielson. “Low Range of Ankle Dorsiflexion Predisposes for Patellar Tendinopathy in Junior Elite Basketball Players A 1-Year Prospective Study.” The American journal of sports medicine 39.12 (2011): 2626-2633.